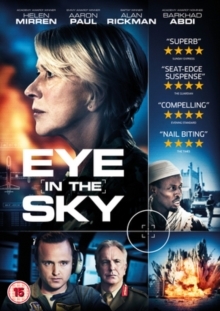 Helen Mirren and Aaron Paul star in this British thriller centred around drone warfare. Mirren stars as Colonel Katherine Powell, a British military officer in charge of a top secret drone mission to capture a terrorist group in Nairobi, Kenya. When Powell's intel indicates that the terrorists are preparing another suicide attack, the British and American forces debate changing the objective of the mission from capture to kill. As they discuss the possible political repercussions of their actions, US drone pilot Steve Watts (Paul) discovers a little girl has entered the targeted strike zone, throwing the coalitions plans into further chaos. The cast also includes Alan Rickman, Barkhad Abdi and Jeremy Northam.